The consistency of scrambled egg is a matter of personal taste - I happen to like mine quite wet whereas what some describe as "fluffy" reminds me too much of what you get if you use put eggs in a microwave. 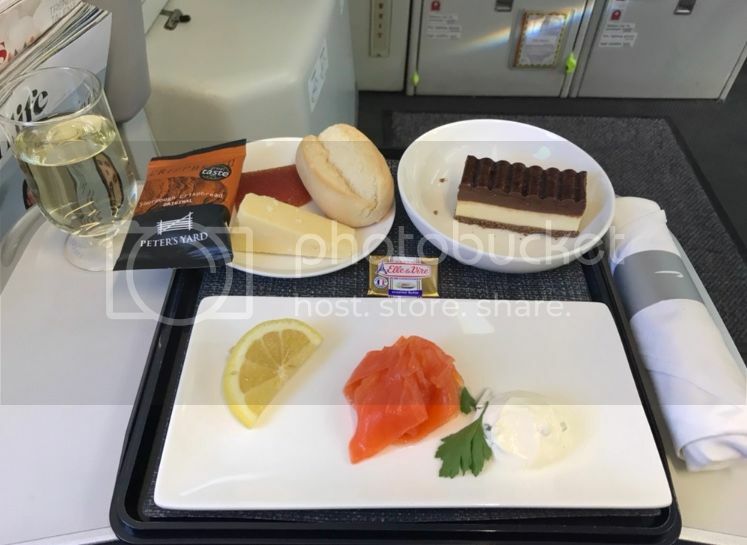 My OH ordered her vegan meal, weeks back, but nothing was loaded (I have it confirmed in myflightsapp, and BA MMB). 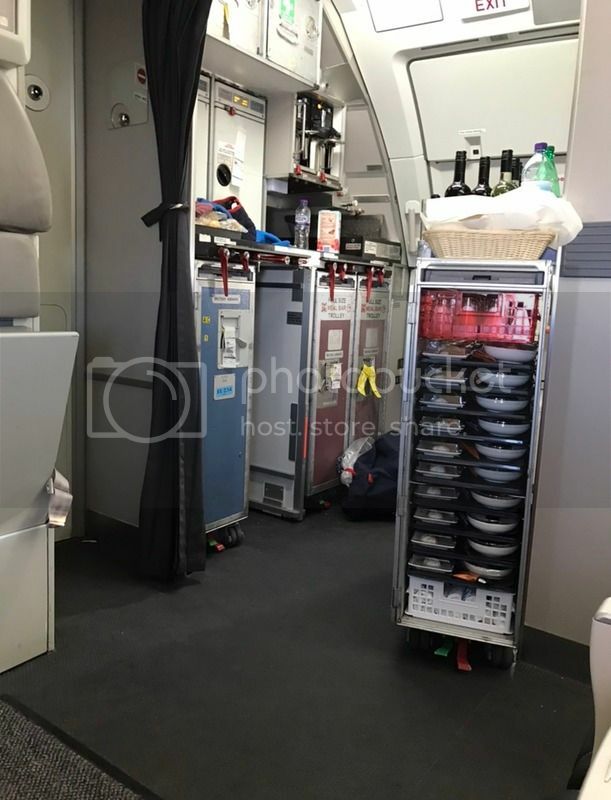 The cabin crew apologised and grabbed a M&S fruit bowl from the M&S menu, plus pastries and jam. BA777 from ARN to LHR on 12 September. My first long and it was impressive. I quite like beetroot so I found the starter very good. For the main I had the Beef Cheek. The cabin crew member (20 years service) noted that this is always very very popular. So popular that she has never come across a leftover one yet so has not had a chance to try it. It was amazing! I told her that when she collected the trays and she said everyone says that. Dessert was fine, the cheese pretty bad. I think the oat cakes are vile and the Brie looked like it had been out in the sun or something so I only had a little of it. Water crackers of some kind are better than oat cakes. Next I flew from London Heathrow to Dublin on the BA824. I selected a Kosher meal as I wanted to see what was offered for this on a post-afternoon tea service. Imagine my utter utter disappointment when presented with 3 finger sandwiches. 17:40 is not an afternoon tea service and I had planned on a "dinner" not an afternoon tea. Taste wise it was fine, but I wasn't in the mood for a sandwich. I also was very surprised on board and did not expect it to be honest. I had the chicken too yesterday and agree it was horribly dry. Mixed with the potato salad helped. But when the choice is that awful beef/jalapeno panani or the chicken - I'll still take the dry chicken every time. 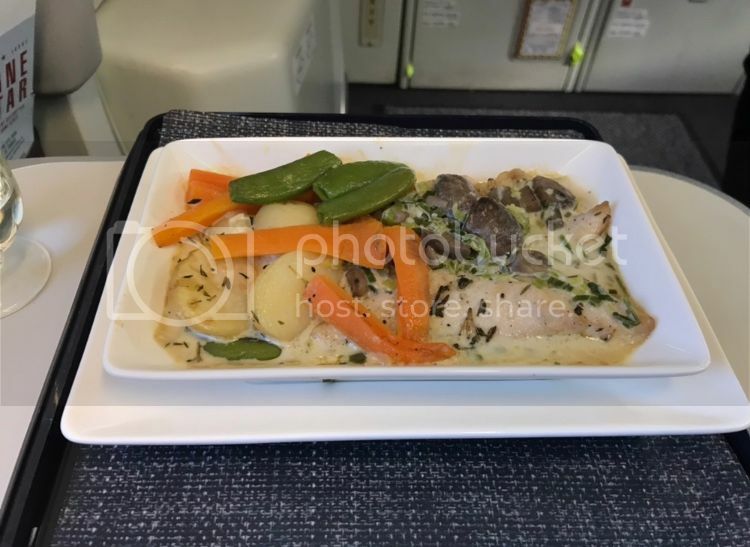 On a recent short band evening meal flight I ordered a vegan meal to get a change from the standard options. Last time I did this I got a rather nice veggie sushi. This time I got something less exciting (lentils and couscous I think, but seemed more filling than the standard option). I noticed someone else ordered a special meal and got sushi (this one looked like it had fish so obviously not the veggie option). Does anyone know what meal option will get me the sushi? I'm not vegetarian so I'd be delighted if it included fish, but happy with a veggie option too. The hot sandwich option wasn't a panini and plenty were loaded. Certainly an improvement Plenty of meals loaded 9 rows of CE. If you order a low fat meal, you will reeive this "fish free" fake sushi you are talking about. What looks like fish is actually picked vegetable. I had it a few times, nice! Yesterday's BA 799 HEL-LHR. Quite empty - row 1 only had 1/4 seats taken, I had the whole ABC section, but I think divider was row 5 or 6? Interesting to note there were M&S menus even up through Row 1. Beetroot starter. Chicken with risotto or beef cheek with mash and vegetables. Chose the beef cheek. Banana dessert and cheese. Beetroot nice, but quite bland and obviously costs BA pennies to serve. Beef cheek delicious but presentation horrific. Cheese bland, oatcakes a bit 'soggy' almost, it seemed. Dessert was sickeningly sweet, not a huge fan. Fairly decent service throughout. At least 4 minis of Cîroc were to be found (I had two, gentleman across the aisle had 2), hoping though doubting that's more than a miscater. You had the exact same meal as the one I posted up thread. Agree with you on the beetroot, it tastes like beetroot which is fine but it's no taste sensation. The beef cheek really is great! So happy with your comments on the oatcakes and the cheese. A complete miss as far as I am concerned. You had the exact same meal as the one I posted up thread. 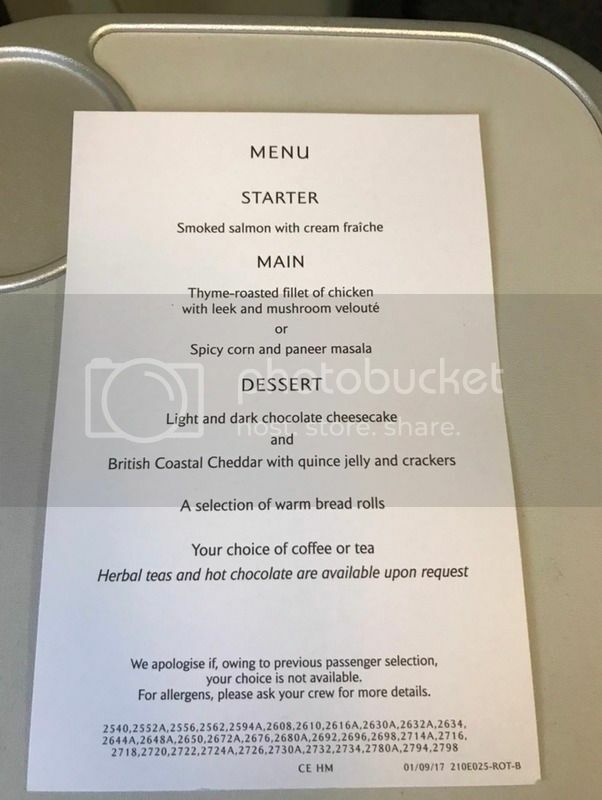 Just in case it's not obvious, the menus are now very standardised: every Long flight leaving LHR in September will have precisely the same menu. There are 3 monthly rotations, we are currently in Rotation B, so in December it will be the same too, but in October we move to Rotation C and a different set of menus. i.e. 3 small slices of chicken for the main. I'm flying AGP-BHX in CE in a couple of Saturdays time. Anyone know how these are catered and what the food may be like?